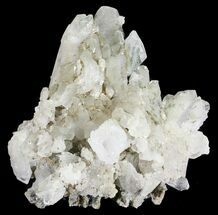 In chlorine rich environments, quartz and chlorite will grow in competition with eachother, often leaving the quartz devoid of its full luster. This can be seen by the mossy green inclusions throughout the majority of our faden quartz with chlorite. These inclusions can occur inside the crystal, giving it a cloudy or misty look. Chlorite can also coat the exterior of the quartz crystal, making the crystal opaque, while still displaying its classic faden quartz shape.